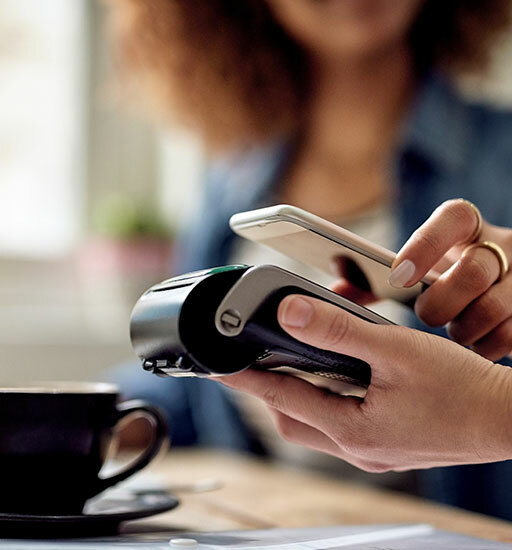 Start by adding your Bank of Canton debit and/or credit card to the Samsung Pay app (you can quickly scan your card using your device’s camera). Once we authorize your card, you’re ready to use Samsung Pay. Samsung Pay enables you to make purchases with your Bank of Canton debit and credit cards using a compatible Samsung device. It can be used at both newer, contactless (NFC) payment terminals as well as at older mag-stripe “swipe” terminals. Your Bank of Canton card number is never transmitted by your Samsung device during the transaction. Rather, it is replaced by a randomized set of numbers unique to each transaction (a process referred to as “tokenization”) for enhanced security and protection. Plus, every transaction is authenticated by your fingerprint, iris scan, or Samsung Pay PIN. Samsung does not store or share any payment information. To use Samsung Pay in stores, swipe up from the bottom of your screen to launch Samsung Pay, and select your Bank of Canton card. Authenticate the transaction by using your fingerprint or Samsung Pay PIN, and once the device is ready, hold it near the payment terminal. A gentle vibration will confirm the payment has been made. Our Help Center FAQs offer additional links and information about Samsung Pay. Samsung and Samsung Pay are trademarks or registered trademarks of Samsung Electronics Co., Ltd. Samsung Pay is available on select Samsung devices. See http://www.samsung.com/pay/ for details. Manage your accounts and deposit checks using just your smartphone or tablet.